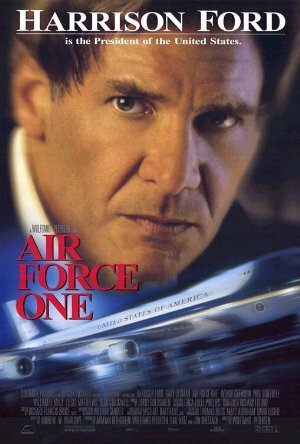 A nice action film, relatively well received, starring Harrison Ford and Gary Oldman, directed by Wolfgang Petersen. Decent summary on Wikipedia. I love Harrison Ford, I love Gary Oldman, I love that Glenn Close is VPOTUS, I love that a random nobody administrative lady gets to send a hero fax, I love that the President doesn't know his own phone numbers, I love the cheesy action and happy parachuting people. Referenced in the very first episode of NCIS! Sorry, should have been clearer: in the first ep of NCIS (not the backdoor pilot), the hero figures out the bad guys by remembering Air Force One plot points. I'm watching this right now. VPOTUS Glenn Close, when faced with a "solution" she disagrees with proposed by an increasingly power-grabby Def. Secy Yueh, doesn't argue, she doesn't tell him he's an idiot, she says, "get me the Attorney General and a copy of the Constitution." Insert heart eyes emoji here. OK just got to the part with the giant mid-air zip line; someone clue me in why we're not just delivering parachutes to the ones on board? Is it the water? Plane was running out of time and fuel, and falling apart. I saw this in theaters in middle school and it blew my mind at the time.